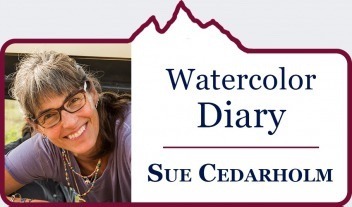 Sue Cedarholm's last watercolor: a composite of a remarkable year, painting every day for "Watercolor Diary"
Today—March 26, 2018—is in a way one of celebration for multi-media artist Sue Cedarholm of Jackson Hole. 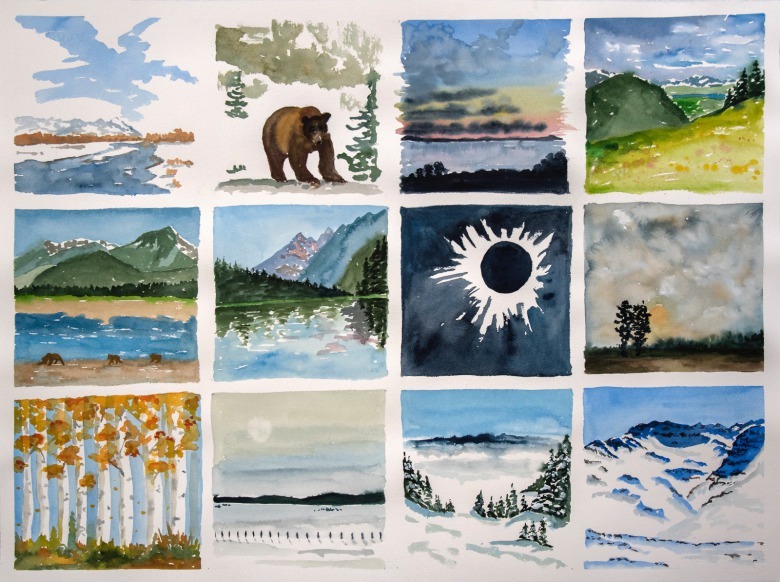 She has reached a point she never thought possible in the beginning, when she picked up a brush and through her series "Watercolor Diary"set out to paint one new watercolor every day as a way of chronicling a year in nature. 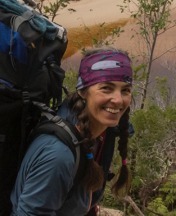 She literally traveled around the world but found her sweetest rewards getting re-grounded in different corners of the Greater Yellowstone Ecosystem. MOUNTAIN JOURNAL: How does it feel now as you complete a year with your project? SUE CEDARHOLM: I have a sense of relief that I was able to actually paint every day for an entire year. I am also very proud of myself to have been able to have been dedicated to stick with it. Once I made it to six months I thought, “Okay, I can do this.” There were a few times during the year when I was going to stop but I made myself power through. Some days it was very difficult to fit it all in, I was painting late at night a few times and then taking a pretty bad photo of the completed painting just so I could post it and say I had made it another day. MOJO: What have the effects been, not only with your painting but with the visual accuity in the way you see landscapes and objects in them? CEDARHOLM: I find myself constantly looking around and noticing more, in the landscape and just in general. Since I always have to come up with a subject to paint I definitely am always looking, looking and looking. I think I also feel the landscape more. I try and convey the feeling I had when I was out skiing, hiking, biking, walking or driving. I hope that when the viewer looks at my paintings they can feel what I felt when I was there. I also notice shapes more – painting is all about the shapes, color and light. What is the shape of the mountain? After I have painted a mountain, for instance Cody Peak at the Jackson Mountain Resort, then the next time I was out skiing I saw the mountain in a different way. I had studied it so much that I was familiar with every cliff. As I go through my day there are moments when I think, “that is what I am going to paint next.” Something will just strike me and I know I have to record it with my paint. MOJO: During the last year you've been all over the world—to Tasmania, Africa, South Georgia (on the doorstep of Antarctica), Alaska and back again to your home base in Jackson Hole. As you contemplate the state of the wild world and our human connection to it, what comes to mind? CEDARHOLM: I was in South Georgia and Africa right before I started my watercolor diary. They weren’t technically part of the 365 days. But I did put some “memory” paintings of those trips into the 365. I started the painting every day before I was headed to Tasmania. I wanted to paint while I was there and I needed to hone my skills so I thought I would paint for the month prior and then paint on the trip. Once I got home from my month in Tasmania I decided to stick with it. I had a great summer of hiking, backpacking, camping and kayaking in the Tetons. MOJO: How did your perspective change? CEDARHOLM: Spending so much time outside you see so many things. Since I was in the Tetons during the summer months I was able to see how many people are out there enjoying nature. You also realize how our national parks are being loved to death. If you don't get out hiking early you can’t find a parking place and you end up in a line on the trail. There is nothing better than being up early, getting to your destination early, relaxing by the lake, painting the scene, heading back down the trail just when the masses are starting up. MOJO: You've said you discovered something else—that solace in nature is not a stadium experience or an encounter like seeing a film in a theater, that intimacy with nature on its terms involves being a human standing humble before nature. CEDARHOLM: It is great that so many people are out there, but will there become a time when are there too many people? The impact in many places is already visible with trail wear and tear and the massive numbers of cars trying to park. Even in the wilds of Alaska you see more and more people. The bear lodge where we were photographing is now overrun with day-trippers flying in for a few hours of seeing a brown bear. I don't blame anyone for wanting to see a bear up close. It is a hard call, people want and need nature but we can ruin it. It is harder and harder to find a place where you can be alone. MOJO: Okay, which medium is your favorite—watercolors or photographs? CEDARHOLM: I don’t have a favorite. I photograph all the time, using my iphone for snapshots to remember a scene and with my Nikon DSLR camera when I am more serious. I paint plein air and from photos. When I know I am making a photograph that I will be using for painting I look at the scene differently. I have been lucky to travel the world photographing nature and wildlife, those experiences are in my subconscious and I hope that comes through in how I paint a mountain or a river. I know what the air feels like, the texture of the trees, the shape of the cliffs and rocks, and how the earth smells after a rain. I think I need to do both photography and painting, they work hand in hand. MOJO: Reflect a bit on some of your favorite moments? CEDARHOLM: That is a hard question to answer. Backpacking for eight days on the South Coast Track of Tasmania ranks right up there with the wildest places I reached all year. The scenery was spectacular and rugged, huge mountains, rainforest and crashing waves on the beach the waves come all the way from Antarctica. It was the hardest backpack I have ever been on. CEDARHOLM: Being there to witness the eclipse was, of course, cosmic. But most of my delights involved more subtle outings. CEDARHOLM: All the hikes in the Tetons. Painting became a reason to reject parking myself behind a desk or laptop—something I would highly recommend. My friend and I tried to get up every canyon in Grand Teton National Park. We nearly did them all. It was really wonderful to get back up into the mountains every weekend. You never tire of the Tetons even after living here for three decades. MOJO: How did you put yourself in a different frame of mind because many days you would work and then race out to catch the late light? CEDARHOLM: Evening kayaking on String Lake was a perfect way to wind down, when you go late in the day everyone has left, it is peaceful. The reflections were astounding. I think people got tired of all my reflection paintings but once painting became part of my daily routine it is something I counted on every day. There bears in Alaska in Jackson Hole—you can’t go wrong there, huge landscapes with many bears, gotta love that. And winter. When the snow arrived I was skiing every weekend. My grown children are nice enough to let me ski with them and we had a blast. Since winter is so long here there are a lot of snowy paintings in the series. MOJO: You recently went to Europe and carried along the paint kit in your backpack. CEDARHOLM: The absolute highlight of this winter was a spontaneous trip to ski at Val d’Isere in France. I had never been to Europe, only to change planes in the airports headed to Africa that is. It was a real treat to go to the Alps. The first day we got to the top of the mountain, it was a bluebird day and the peaks were spread out in front of us. I was in shock and awe at the beauty of it all. We skied like crazy for three days and zip I was back home. I can’t wait to get back to the Alps. MOJO: This project has been your way of grounding yourself in moments? Would you recommend it as a technique and why does it matter? CEDARHOLM: I would highly recommend doing a painting a day or write in your journal, write a poem, something to make yourself reflect on each day. Doing this makes you find a moment that was special, some days you have many special moments, enough to last for a week of painting. Other days it is hard to find something that you want to share or remember, those are the hardest days, the days you have to look and look. If you look hard enough you will always find something. My joke was, “I can always paint the dog.” Skye, my border collie, did show up quite a bit, but he is pretty central in my life. Because I am a visual person I like to flip back through the paintings and “see” my year. This has been a good learning experience for me. I think my painting improved over the year. I know my confidence in the medium became stronger. So since I made it one year why not try for two. I am headed off on new adventures this coming year so what better way to document them than a painting a day. When I look back over the year through my paintings I feel so lucky to have had the year that I have had. We all can have a great year. My advice: Start by trying to consciously dwell in moments. Find a quiet place and don't try to insert yourself into a scene. Step back and find amazement as the wild world spins around. Jackson Hole-based Sue Cedarholm is a multi-media artist—painter, photographer and maker of nature-themed, wearable apparel. You can find all of the works in her ongoing series at Watercolor Diary.